Alaska remains one of the last pristine wilderness areas in the country. This vast landscape is home to the crown jewel on the National Wildlife Refuge System and one of the last intact landscapes in America, the Arctic National Wildlife Refuge. Within Alaska’s largely untouched lands some of America’s most iconic wildlife including hundreds of rare and endangered species find haven. Working to protect the Arctic National Wildlife Refuge, Kenai National Wildlife Refuge, Izembek National Wildlife Refuge and other key ecosystems from the threats posed by climate change, unsustainable development (including oil and gas drilling), and unsound wildlife and habitat policies and management practices. Addressing the population decline of the endangered Cook Inlet beluga whale. Working to protect wildlife such as brown bears, wolves and lynx from aggressive predator control actions by the state on national wildlife refuge lands. Working with the U.S. Forest Service and other partners to ensure that revisions to the Chugach National Forest management plan are based on well-developed climate and habitat assessments, and include measures to protect Kenai brown bears and other wildlife. 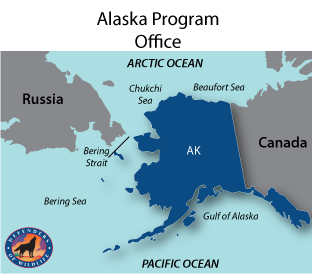 Working with 15 Alaska Native Bering Strait communities to increase community engagement in spill preparedness, planning and response in the largest marine wildlife corridor on the planet. This engagement will minimize spill impacts on marine mammals with response plans guided by science and Indigenous Knowledge. Working with the U.S. Fish and Wildlife Service and local communities including the Kaktovik to increase the use of nonlethal coexistence methods to keep people and polar bears safe. Promoting and building conservation tools like the Bering Strait Response Teaching Tool and unmanned aerial vehicles to map polar bear maternal dens. Sponsoring remote cameras at key Pacific walrus haulout locations to help scientists learn more about deadly stampedes and impacts walruses are facing from climate change. Working to ensure that wildlife, including Alexander Archipelago wolves, Queen Charlotte goshawks, northern flying squirrels, martens, bats and other species and their habitats, are protected under the forthcoming amendments to the Tongass National Forest management plans. Wolves always seem to get the short end of the stick in Alaska, where politicians often shoot first without even bothering to ask questions later. But that wasn’t the case this time.